President Donald J. Trump presented the Medal of Honor to former Spc. 5 James McCloughan during a White House ceremony July 31. McCloughan, a medic and a Vietnam veteran, was one of 89 soldiers in Company C, 3rd Battalion, 21st Infantry Regiment, 196th Infantry Brigade, Americal Division, who fought on Nui Yon Hill near the city of Tam Kỳ, from May 13 to 15, 1969. Within minutes of landing there on May 13, about 2,000 enemy soldiers had the unit surrounded and two of their helicopters were shot down, Trump related during the ceremony. One soldier was badly wounded in the middle of an open field, the president said. After taking care of that soldier, McCloughan joined a mission to advance toward the enemy, Trump relayed. But before long, they were ambushed. Again, he ran into danger to rescue his wounded men. As he cared for two soldiers, shrapnel from an enemy rocket-propelled grenade “slashed open the back of Jim’s body from head to foot. Yet, that terrible wound didn’t stop Jim from pulling those two men to safety, nor did it stop him from answering the plea of another wounded comrade and carrying him to safety atop his own badly injured body. And so it went, shot after shot, blast upon blast,” the president said. “As one of his comrades recalled: ‘Whoever called medic could immediately count on McCloughan. He’s a brave guy,’” Trump said. That evening, soldiers went into their defensive position. However, one soldier didn’t make it back and McCloughan could not ignore his pleas for help. Again, “Doc,” as his men called him, did not hesitate, Trump said. But after several minutes, McCloughan emerged from the smoke and fire, carrying yet another soldier, the president said. As McCloughan was carrying the wounded to be evacuated by medevac, his lieutenant ordered him to get in too. “Get in. Get in,” Trump said, conveying the lieutenant’s orders. Over the next 24 hours without food, water or rest, McCloughan fired at enemy soldiers, suffered a bullet wound to his arm and continued to race into gunfire to save more and more lives, the president said. “Though he was thousands of miles from home, it was as if the strength and pride of our whole nation was beating inside of Jim’s heart,” the president said. In those 48 hours, Jim rescued 10 American soldiers and tended to countless others, Trump said, adding that of the 89 in the company, their strength had dwindled to 32 by the end of the fighting. On the second day of that bloody fight, McCloughan found a soldier who had been badly shot in the stomach, Trump said. He knew the soldier wouldn’t make it if he flung him on his back in a fireman’s carry. So he lifted him up and carried him in his arms. As McCloughan was carrying the soldier, a thought flashed through his mind. In that moment Jim offered up a prayer. He asked God: “If you get me out of this hell on earth so I can tell my dad I love him, then I’ll be the best coach and father you ever asked for,” the president said. Jim said those words over and over again for the next 22 years until the last time he saw his father, the night before his dad passed on. “Today, I venture to say, his dad is the proudest father in heaven,” Trump said. The president added that McCloughan kept the other part of his promise to God as well, coaching high school sports to the best of his ability for the next 38 years. 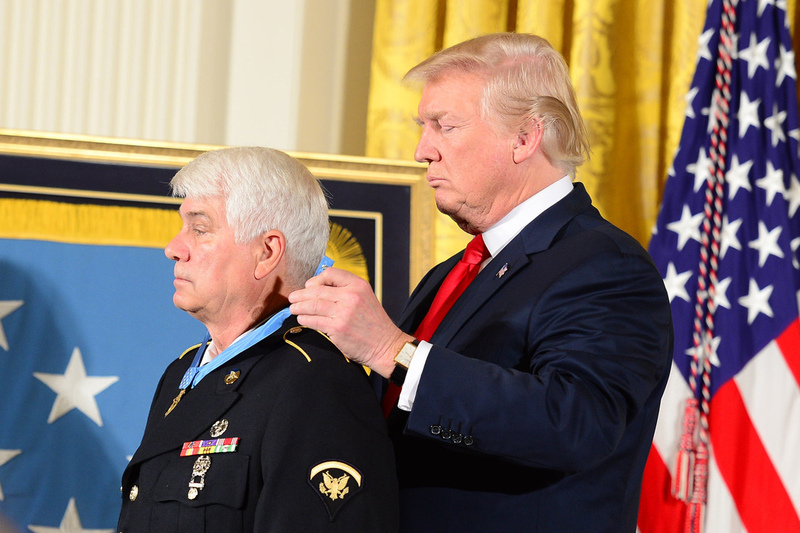 McCloughan was joined at the White House ceremony by members of his family, eight other Medal of Honor recipients, and 10 soldiers who served with him during that epic battle, five of whom McCloughan personally saved.